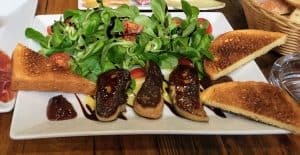 I love seared foie gras. But, damn, is it a conflicting love. Even though there’s science to support that it isn’t as bad as detractors say, I still feel guilty every time I order it. It’s such a seductress. The sultry whispers of earthy sweetness tickling the nose. Then that first buttery morsel melts in your mouth. You can’t help but close your eyes and let the rest of the world drift away. But eventually, the affair is over. Then you’re sneaking back to reality, wondering where your wedding ring is and if you smell like pepper, nutmeg and shame. Yes, few things so bewitch and bedevil me as my love of foie gras. However, I’m starting to realize that the wine industry has its own foie gras guilt-trip coming. And it’s going to leave more than the goose livers seared. So exciting! Yet so, so soooooooooo bad. You would think that all things related to climate change are muy mal. But that is not quite the case. Don’t get me wrong, there is a lot of bad—just ask anyone still trying to thaw out from the recent polar vortex. However, you know what else is an effect of climate change? This Chapel Down Three Graces was seriously better than many $100+ Champagnes out on the market. 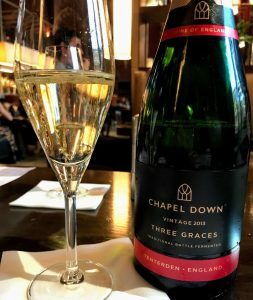 The booming English sparkling wine scene. An influx of talent from California and elsewhere into Oregon. The steep learning curve and jump in quality of Canada’s wine industry. More study and advancement in our knowledge of grape clones. The string of successful vintages in Switzerland and Champagne–which apparently means more Dom Perignon and gummy bears. Riper Rieslings coming out of Germany–as well as more German red wine. Growing acceptance and excitement over hybrid and non-vinifera grapes. The rediscovery of “long lost” vinifera varieties that are better adapted to longer growing seasons. Oh, and now there is a thriving wine industry emerging in Scandinavia as well. My heart fluttered reading the recent report in Harpers about the pioneering work of producers in Sweden and Denmark. Alongside longer and warmer summers that have extended the Nordic growing season into September, winters have been milder by almost 2°C, according to Sweden’s Rossby Centre for climate research. Even at 56 degrees latitude, these areas are actually receiving more hours of average sunshine during the growing season than some European neighbours to the south, with colder air tempered by proximity to the sea. Not only are the Swedes and Danes bringing more prominence to unique grape varieties (Solaris! Leon Millot! Rondo!) but several are exploring cool-climate expressions of traditional vinifera like Merlot, Cabernet France and Chardonnay. I hate that I find this so exciting! I’ve yet to try a wine made from Solaris but it is high on my list to seek out. These grapes are from Chateaux Luna in Lysekil, Sweden. I wrote a few days ago about how boring wine is becoming to Millennials. My cohorts crave new experiences and want to try things that are different than what our parents and grandparents drank. The industry needs to respond to these changing tastes and stop trying to market the same ole, same ole to us. How much more different, unique and exciting can you get than an English sparkling wine, a Gascon Tardif or a Swedish Solaris? So yay! No, wait! Bad! But yay? All these new and exhilarating changes are the “foie gras” of the wine industry. It’s hard not to be seduced by their potential and appeal. But you don’t really want to think about how it got to your plate. Make no mistake, the same shifting wine map that brings all the interest and excitement to new and emerging regions is doing that at the expense of already established areas. And at the expense of, well, glaciers. The most obvious is the rising sugars and high alcohol levels that have been a long time battle. Winemakers have become almost circus performers in a balancing act, trying to keep sugar levels in check and pick before acids fall too much. Tempranillo already gives me issues in blind tasting–especially between young examples like this and older examples with more bricking. Climate change not only upends the classic profiles of aroma and structure but also potentially that of color as well. This adds to the harvest complications of the numbers (brix, TA and pH) being ready to pick before the aromatics and flavors are fully developed. Additionally, rising temperatures have an impact on the anthocyanins that give wine color–leading to less intensely pigmented wines. For students of blind tasting, this changes how much weight and certainty we can give color in identifying wines. It’s especially tricky for producers who want to avoid overly manipulating their wines. But the use of alcohol-tolerant yeast and ML cultures and processes like acidification, reverse osmosis, ultrafiltration and more are increasingly becoming the norm. Not only do you sacrifice more natural and authentic winemaking, for many regions, there will also be a point where they can no longer “adapt” to a changing climate. Numerous wineries, vineyards, jobs and livelihoods will be lost. Oh and, yeah, don’t forget about more hurricanes, tornados, polar vortexes, rising sea levels and everything else that is happening to the planet. It’s easy for us to talk about all the bad things involved with climate change. It’s also easy for us to get excited and celebrate all the new developments that are bringing new wines to our attention. But it’s not so easy to connect the two and reconcile them. Yeah, there are some areas that are making the best wines that they’ve ever made with strings of successful vintages. This has made good wine more consistent, affordable and available than it has ever been. Yeah, there is a lot of potential in cool-climate wines, new regions and new grape varieties. In many ways, this is the shot-in-the-arm antidote that the wine industry needs for some of its most vexing ills. Yet, what good is an antidote if it ends up wiping out the entire hospital? Tagged Chapel Down, Danish wine, English wine, Harpers, Leon Millot, Norman Miller, Rondo, Solaris, Swedish wine, Tardif, Tempranillo.